Perfect for everyone managing staff rotations, on-call duty time and team vacations & leaves. Additionally ideally suited for equipment and room allocation planning. 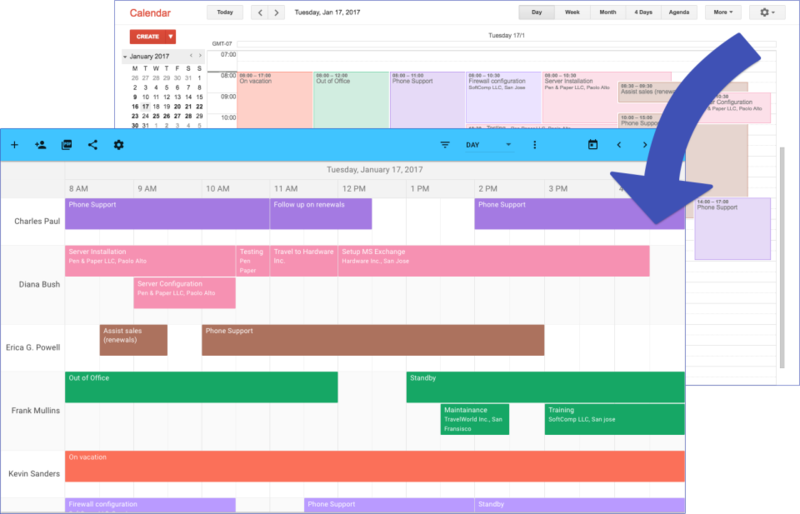 Enhance your Google Calendar with team scheduling and planning functionalities. 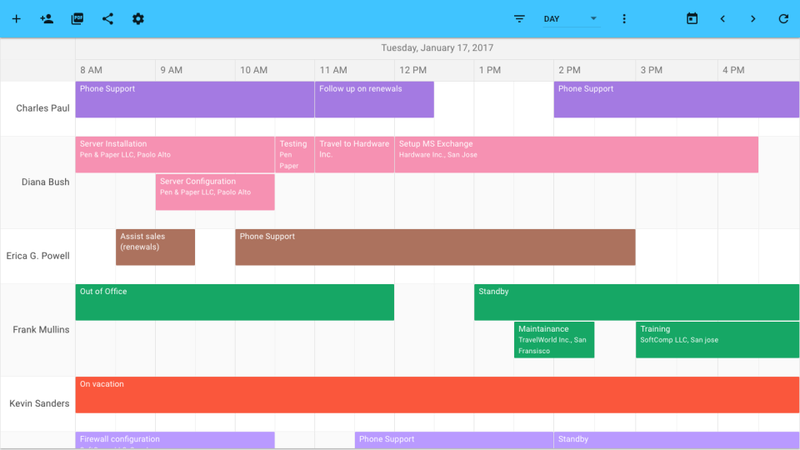 TeamCals Schedule View is a new horizontal layout for Google Calendar that displays many calendars at once. See employee availability easily by comparing events on a timeline. With a quick glance, you can identify scheduling gaps and prevent overbooking. Pros: I like that it goes directly to the employee's calendar so that they see the tasks daily. If they have other meetings or vacations on their calendar, we are able to see it and avoid any conflicts. I also like that it is pretty easy to us with the drag feature. Cons: I think it still has a lot of room for growth. For what we use it for as an interior design firm, we have a lot of repeating tasks from week to week, and it is not as quick as other programs we have used in the past (Forecast, for instance). We have to put in the project and description every time and if we do drag the task through the week, it puts the task at the top of the google calendar rather than in the employee's daily calendar. The different format can be confusing at times for employee's. Overall: I think it's been helpful for our team. Unlike Forecast, only those who have access to Team Cal and the actually employee getting the task can see the schedule. For those that may work with the employee that day, they wouldn't know what their schedule is unless they asked or were given access. 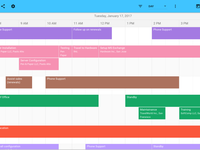 Pros: Teamcal syncs with Google Calendar and provides an easy to understand schedule view. It's really great because scheduling meetings for multiple people with Google Calendar can be difficult. 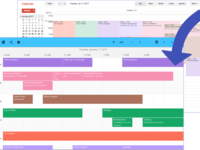 Google Calendar doesn't have a scheduling view, and that's what Teamcal provides. Teamcal layers each person's calendar as a row so it's easy to see when someone is free. Cons: The software is really simple - it does what it says and nothing more beyond that. It would be great to have additional features related to project management. Overall: This has saved me time (and grief!) at work. Pros: Most of all I like the direct Google Calendar integration. Meetings and other calendar entries added by my team members are displayed automatically in TeamCal. The integration makes planning super fast because I don't need to run around and bug everyone for their appointments. Cons: It doesn't offer any functionalities for time tracking. For the use case I need it it's great, but it might not be a good fit for others. Overall: It has been an excellent experience for our team so far and replaced a bunch of other tools we used for team planning. Pros: I am using the software probably a little differently than it was intended but it is working pretty good for us. We are a small to medium sized company with a lot of projects happening at once and we are using TeamCal to help identify where resources might get stretched. We aren't using it to manage the projects, we are using it as an overview tool. Cons: Because of the way we are using the software we would really like to be able to see things in a 3 month at a time or more format like the Gantt software allows. I think that it would be helpful if the weekend days were shaded a different color. Overall: It's been an overall good experience. When I was trying to use Gantt in this way they were the ones who suggested to try this and it has been working good. would just love a couple of changes mentioned above to make it even better.